The New Biography looks at the life stories of eight famous women in nineteenth-century France who became public figures even though they lived in a society that did not encourage women to speak out publicly. All of these women—activists, writers, and philosophers—became controversial figures who challenged conventional notions of femininity in their time. 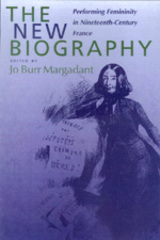 By showing how these women deliberately created their public lives, Jo Burr Margadant and her colleagues demonstrate the rich rewards of the new methods in biography. In her introduction Margadant gives a brilliant explanation of the new biography and how it fits into recent and current debates about the writing of history. Each essay that follows connects the lives of the women it discusses with major themes in French history. The famous activist Flora Tristan, the feminist journalist Marguerite Durand, and a leading advocate of birth control, Nelly Roussell, are just a few of the fascinating women brought to life in this book. Because these stories often expose the cracks in what has been seen as a monolithic separation of gendered spheres in nineteenth-century bourgeois France, they challenge historians to rethink assumptions about the history of this period. The New Biography thus joins a body of work that brings women from the margins of the historical record into history's mainstream. Jo Burr Margadant is Associate Professor of History at Santa Clara University. She is author of the prizewinning Madame le Professeur: Women Educators in the Third Republic (1990).